Despite what many think, switching your pet to a raw meat diet can be easy for both of you. Our feeding guide will help you determine how much and how often to feed your pet, and the Eureka! packaging is simple to handle and store. Eureka! will make mealtime something for you and your pet to get excited about! Transitioning your dog or cat to a raw-meat diet is far less disruptive than many believe. For trouble-free transition to Eureka!, phase it in over a short period of time. Simply substitute 10% of the original food each day with the Eureka! formula until the full meal has been replaced. If your pet is accustomed to “free feeding,” or having food in his bowl all day long, he will quickly realize the new schedule and come to appreciate the new, healthier option! Older pets and finicky eaters may need more time to fully transition. Cats can be particularly picky as well. Dogs and cats are creatures of habit—they prefer to be fed the same meal at the same time in the same place every day. As mealtime approaches, you’ll notice your pet looking for their food bowl. Erratic feed times can disrupt their mood and appetite, so consistency on your part is key to gaining their trust. Eureka! raw-meat formula is highly nutritious and free of fillers like vegetable protein and grain, so your pet’s serving may be significantly smaller than before. We recommend you start with 4 oz. per every 10 pounds of body weight per day (or 0.4 oz per pound). 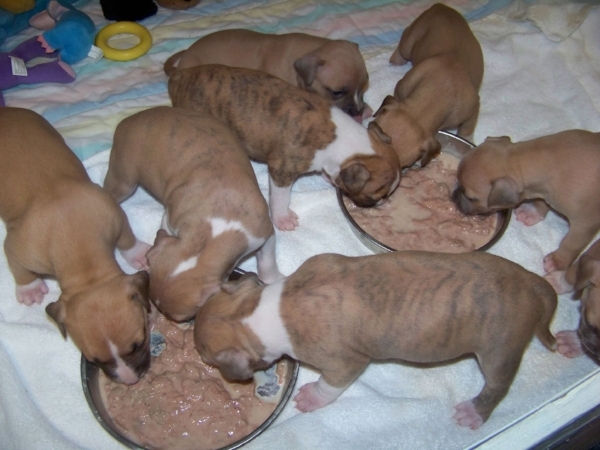 Adult dogs can be fed either once or twice a day, three times daily for puppies. This serving is ample, even for very active dogs, as Eureka! is concentrated nutrition. Based on your observations, adjust up or down, inactive dogs will likely do well on less. For overweight dogs, feed half this amount until desired weight is achieved, then increase slightly to a maintenance level. Raw-meat diets are no new fad to the animal kingdom; just ask a pack of wolves. Although your pets may not be roaming the Alaskan wilderness, their dietary necessities have not changed dramatically. However, we’ve been conditioned as pet owners to believe that wanting to play fetch or chase a ball of string means that our pets should eat hard dry pellets instead of the meat that their bodies are designed to digest. Eureka! gives your pets the opportunity to eat as they were designed to eat. You’d be amazed at the effect on their mood, coat, and excitement about dinnertime. A raw meat diet mimics what carnivores, dogs and cats, would eat in the wild - uncooked meat, no grains, no vegetables. Your dog’s or cat’s digestive system is exactly like its wild counterpart, and 99.8% the same genetically. Any type of processing destroys essential amino acids and enzymes that are necessary for you animal. The effects of feeding a raw meat diet may include: cleaner and whiter teeth, healthy skin and shinier coat, decreased body odor, higher energy level, less stool volume, excitement for meal-time and less time and money spent at the vet. Conventional pet food is loaded with fillers like vegetable protein, grains such as corn, wheat or rice, and artificial additives and preservatives. Due to spoilage problems, the natural fat content required by dogs and cats must be kept low. It may contain “beef” or “chicken,” but this can mean hooves, feet, lung, heads, tails and other scraps that contain little meat protein. It is usually formed into bite-sized kibble, loaded with preservatives, and baked, zapping the last of any remaining nutrients, enzymes and antioxidants. It’s like fast food for animals. It has been suggested that over time, conventional pet foods may cause health problems such as diabetes, skin irritations, obesity, loss of appetite and bad breath. This breakdown in health is alleged to alter the DNA of your pet and, if bred, may even pass chronic disorders and genetic defects to its litter. Feeding your pet a Eureka! raw-meat diet may help correct many of these ailments. Our standard formulas contain only muscle meat, so it’s like feeding your dog steak. We don’t add cheap fillers like vegetable protein or grains to our standard products, and we never add preservatives or other artificial ingredients. We package our formulas in their natural, raw state because it’s the healthiest, most natural option for your pet. Our recipes were created by a wildlife biologist, zoologist, and chemist, Eureka's founder and owner, and have been sold for over 30 years. Seventeen of the top twenty Iditarod dog racers feed Eureka!. Our artisan formulas were refined and perfected by observing generations of canines eating only this food. Eureka's founder closely studied skin, teeth, energy level, stool production and overall health throughout these generations of animals. Each formula contains a unique blend of proteins, fats and other essential nutrients to optimize the health and well-being of your pet. They contain no artificial preservatives or additives. Eureka! has been tested by the canines of yesterday to sustain, nourish and heal canines of the future. Our formulas are time-tested and proven. 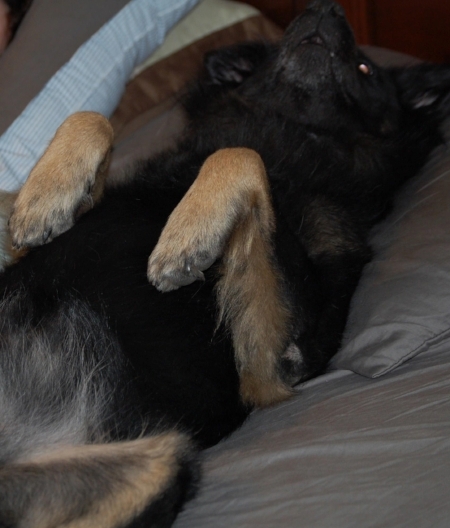 Is Raw Right for Your Pet? Many opponents of a raw-meat diet base their arguments on theory and supposition, having never fed or actually observed the results. So we encourage you to look to your pet for answers. Replace their usual meal with a Eureka! formula for two months and record the results. Take before and after pictures in similar lighting conditions. Consider your pet’s mood and physical appearance. Notice how your pet produces less stool, the whiteness of its teeth and color of its gums, the change in skin disorders and how their overall digestive health improves. With over 30 years of experience of formulating blends for dogs and observing the results, we are confident you will witness the benefits yourself. Please feel free to share your pet's transformation. My Labrador, Tule, is now 13 years old. She has arthritis and dysplasia. Those conditions have been progressing in recent years. She gets supplements, adequan injections, and massages to help manage those conditions. I started her on Eureka in August of 2010. Immediately, her coat improved. It is shiny and soft again. She also has more energy and seems more mentally there. She still gets fleas, but rarely ends up with hot spots since she’s been on the Eureka. Her teeth are the real difference. She had a lot of tartar on her teeth, being 13 and never having had a dental cleaning. Within the first month, her teeth looked much better. Now they are in excellent condition and her breath is much better. Tule also used to vomit a lot, she had done so for many years. I found I had to buy her a pre-biotic supplement to keep her from vomiting. After changing over to the Eureka, I have been able to eliminate that supplement altogether. That alone saved me $17 a month plus shipping. She has only vomited on rare occasion now, and there is always some other factor involved that causes the vomiting. Since she has more pep, she’s been more active and has appeared to have gained a bit of muscle mass back. I am sold on the Eureka as her only food. I like that I am only paying for this mixture of meats and vitamins and minerals. I have fed several other popular raw products, but they all had vegetables included and less protein by far than the Eureka. In fact, none of the other raw diets had the amount of protein in the grain-free kibble I feed my other 2 labs. If I am going to feed raw, I do not want fruits and vegetables mixed in. I can add those myself. I did not want to “go raw” by buying the meat myself. I don’t like handling raw meat and I was unsure of what other supplements I would have to add and when. Eureka has done all that for me. I just take some chunks out of the freezer, let them thaw, and feed them. They resemble very finely ground hamburger and are easy to store. I don’t need any other supplements than the joint supplement I feed.